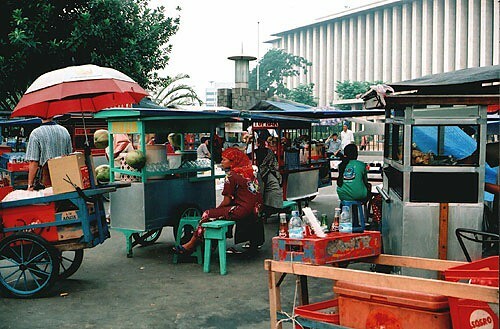 On November 5, 2012, The Jakarta Globe reported that the Jakarta administration plan to provide permanent areas for street vendors. The Jakarta Deputy Governor Basuki Tjahaja Purnama had discussed this idea with the chairman of the Jakarta chapter of the Indonesian Street Vendors Association (APKLI). The Jakarta APKLI and the Jakarta administration plan to provide permanent areas in malls, traditional markets, schools and offices for street vendors to operate their businesses. The Jakarta APKLI estimated about 300,000 street vendors operating their businesses in Jakarta. The plan is to resettle the street vendors in permanent areas gradually. The street vendors will not be charged with rental fees in the first year or two and begin pay installment after that period. kakilima, originally uploaded by yuna lee. The prominent cases of persuasive street vendor relocations are in the city of Solo. In 2005, the newly elected mayor, Joko Widodo, relocated 989 street vendors from the elite urban monument park of Banjarsari to Klitikan traditional market (Tempo 2008). Mayor Jokowi, as the mayor is popularly known, persuasively convinced the street vendors about a plan to restore the monument park of Banjarsari, and offered the street vendors a new place for their activities in Klitikan traditional market. After seven months of negotiations, the street vendors agreed to relocate their businesses to Klitikan traditional market. The city administration waived the business permits and license fees and only asked the street vendors to pay Rp. 6,000 (US$ 0.60) per day for the rent. The Solo city administration had calculated the payments from the street vendors would pay off the city spending approximately Rp. 9.8 billion (US$ 980,000) for building Klitikan traditional market in eight-and- a- half years. In the meantime, the monument park of Banjarsari has been restored as a beautiful and pedestrian friendly monument park (The Jakarta Post 2008). After the successful relocation of the street vendors from the monument park of Banjarsari, the Solo city administration replicated the program to other locations frequented by street vendors including Manahan stadium, Langen Bogan and Mayor Sunaryo Street. The Solo city administration has also renovated several traditional markets including Nusukan, Kembalang, Sidodadi, Gading, and Ngarsapura (Kompas 2009). The street vendor relocations to the traditional market can also be seen as the transformation of the street vendors from the informal sector to the formal sector. The success of Mayor Jokowi’s approach of street vendor relocations has been also replicated in other Indonesian cities. At the metropolitan scale, new spatial plans are required to recognize and accommodate the informal sector. The draft 2030 Jakarta spatial plan is a good example of this, recognizing the informal sector in the metropolitan area of Jakarta as a distinctive land use designation (DKI Jakarta 2010) for the first time. This means the plan specifically accommodates informal sector activities by designating space for small-scale enterprises in offices, trade, services and industrial areas. These spaces are integrated with those for the formal sectors. Each city district (Central Jakarta, West Jakarta, East Jakarta, North Jakarta and South Jakarta) has several areas designated for informal sector activities. While neither the Spatial Planning Law 26/2007 nor the guideline for the urban spatial plan making process (PermenPU 17/PRT/M/2009) provide a definition of the informal sector, the draft 2030 Jakarta spatial plan does by specifying types of activities including street vendors, small food home industry and other small scale industries that are located in residential areas. Spatial planning in Indonesia has a long history of poor implementation and of simply being ineffective. This does not appear to have changed. During the Suharto regime regulations were interpreted liberally and restrictions were deemed flexible by central government to benefit Suharto’s extended network including the interests of large developers (Dharmapatni and Firman 1994). No sanctions were ever imposed against violations of the former Spatial Planning law (24/1992), rendering this ineffective (Firman 1997). Since the Reformasi, spatial planning laws are often violated or overlooked by local authorities to increase development, and therefore the income and tax base, of their locality. Many local authorities are seen to behave like “little kings” (Firman 2008). The enforcement of spatial planning law, then, is still weak at ensuring the availability of urban space for street vendors. Street vendors are a critical part of the Indonesia economy. They are not groups who have failed to enter the economic system in urban areas, but are one of the modes of urban transformation inseparable from urban economies and urban development. Within planning, then, the informal sector should be seen as a mode of urbanization that connects various economic activities and space in urban areas. It requires an understanding that the informal sector comprises an important part of the economic structure. The provision of the informal sector in the draft 2030 Jakarta spatial plan is expected to allocate designated urban spaces to street vendors and integrate them with the formal sectors. This is potentially part of a new recognition of the importance of informality in Indonesian cities. Yet to make it work, the new spatial planning laws and instruments must be enforced to ensure designated urban spaces for street vendors are respected. Without strong law enforcement, the Spatial Planning Law 26/2007 will be unable to transform the spatial planning practice in Indonesia into a more democratic and accountable one and ensure the availability of urban space for street vendors. Tempo (2008). Joko Widodo, walikota Surakarta wali kaki lima (Joko Widodo, Mayor of Surakarta mayor of street vendors) 22 December 2008. The Jakarta Post (2008). Joko “Jokowi” Widodo: Changing the face of Surakarta. (2008). 29 October 2008. The Jakarta Post (2010) Vendors pay up to Rp. 2m in illegal fees. 30 August 2010.